We are currently looking to recruit a full-time partition / suspended ceiling fitter to help with our expanding requirements. 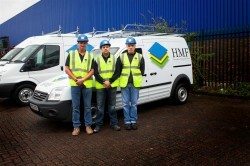 Duties will include; to work alongside HMF installation teams with the fitting out of commercial / industrial buildings, partitioning, ceiling & storage equipment. This role would suit an enthusiastic and reliable person who would like to contribute to the smooth running of our fit out projects. A competitive salary will be offered dependent on experience.